Recently we had the privilege of experiencing our first Jewish Wedding. It is difficult to articulate how amazing this was and how honoured we were that Samara and Ben allowed us to capture their incredible celebrations; the beautiful ceremony, the fabulous traditions and the mind blowing dancing are just a small part of this wonderful story. It is our mantra that we never use flash at weddings, we personally prefer to capture the atmosphere and feel of the day without it and this was certainly a challenge at this wedding due to the fast paced nature of the action but it was one that we relished. We completely immersed ourselves into the raucous activity: our cameras got knocked into our faces, people fell on us and trod on our toes more times than we could count and we had glasses of water thrown over us… and we LOVED every second of it. Jewish Wedding Photographer, Dominique Shaw and Liam Shaw are the creative partnership behind York Place Studios and strive to create emotional, storytelling photography that captures the real moments of your wedding day. Based near York and Leeds, the destination wedding photographers travel across their home county of Yorkshire, the UK, Europe and worldwide to capture your special moments. LOVE that confetti shot! Awesome! Killer dance shots dudes. LOVE IT!!!! LOVE your party photos. So much energy and people just let loose. Great collection. Ah man I love every bit of this! One of my favourite set of party photos ever. You two rock. Oh man this looks like a fun wedding, you killed it! Great job! Wow. Full on. Superbly captured celebrations. Great angles and atmosphere. What an amazing wedding and perfectly captured! brilliant work guys! 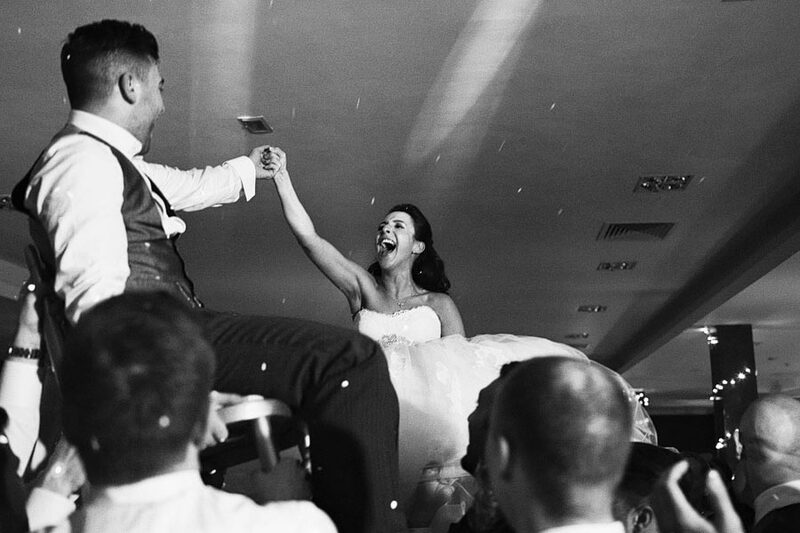 love the dancing shots alot especially of the bride flying! Wow guys, crazy good, full of fun, energy and emotion. Pure class. What a fantastic set of fun, party-down images!! This gallery is brilliant! So much energy! And those lights! It was a wonderful wedding and if this is a snapshot of the day – then I cant wait to see the rest – the best wedding photos I have ever seen – a huge thank you from a very happy and proud Mum of the Groom!